The new flagship HTC device gives us something that I consider significant that you don't get on the iPhone 5 or the Samsung Galaxy S3, and that is the ability to reflow text when zooming in on articles. The lack of text reflow on the iPhone 4 was the final straw that broke the camel's back, motivating me to make the switch to Android. 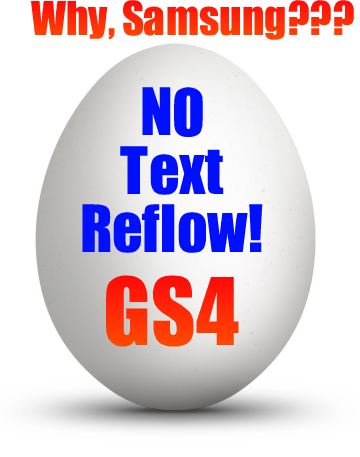 But after buying my Samgung Galaxy S2, I discovered that not all Android devices come with text reflow in the stock browser. Personally, I can't figure out why any smartphone manufacturer would not have this feature programmed into their phones. It makes for a maddening, frustrating experience when using your mobile device to read a lot of content on blogs and news sites (which I constantly do) but you have to pan sideways to read sentences that fly off the right side of the screen. To my surprise, the HTC One does have text reflow built in to the native Android browser. This is a HUGE plus for geeky blog readers like myself who like to zoom in making the text bigger, but reflowing and cascading the text vertically downward thus allowing you to only scroll vertically to read an entire article. If you are a big fan of HTC hardware AND you are an avid reader who prefers using a smartphone to consume content on the web, the HTC One will get the job done for you with its crisp, brilliant display and text reflow capability. Special thanks to AT&T St. Louis for the test device! 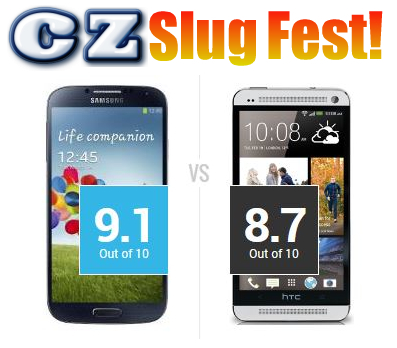 Samsung Galaxy S IV Vs HTC One - Close Call! Today we're going to take a look at the top two Android smartphones on the market. The Samsung Galaxy S IV and the HTC One. This is a close call, but I have a clear recommendation! Many people have asked my opinion on which one of these smartphones to pick up in May of 2013. You can't go wrong with either one of these super handsets, but I'll point out a few differences and tell you why my choice edges out its chief competitor. Both of these incredible smartphones come with 32Gb of internal memory plus 2Gb of RAM. Both units are built to run on the 4G LTE networks of all major carriers that have coverage. Android Jellybean operating system is the standard for both, and each comes with its own version of a UI overlay. As of recent, HTC has added similar features that allow eye scrolling and smart pause for watchin videos. So there's no clear winner with any of these general categories. One comment I have heard from Leo Laporte was that the HTC One has a slightly less durable front glass. He reported that he scratched the display while testing the HTC One, and really wasn't being haphazard with handling the unit. A screen protector could help to avoid this, but if you are one who doesn't like to mask your screen, this could be an issue. What it boils down to is personal preference. If you are the type of person who conserves the juice in your phone, you'll do fine either way. For heavy users as myself, the lack of a removable battery will be a significant issue. I prefer the lighter, thinner design of the Samsung Galaxy S IV because I am accident prone. Others might like the stronger, "heavier" build that gives the impression of better quality. But the heavier they come, the harder they fall. Add to that the issue with the battery removal, and I give the slight edge to the Samsung Galaxy S IV. But again, you can't go wrong with either of these smartphones. The HTC One is still a beautiful, well-built phone with several superior capabilities than most other Android phones. So I give them both a green light. You'll just see me packing a Galaxy S IV with two spare batteries if you catch me out on the streets. What is your opinion of these smartphones? If you are due for an upgrade, or if you've just bought one of the two of these smartphones, I'd love to hear why you chose one over the other. Share your thoughts in the Disqus comments section! GO SHOPPING NOW FOR THE BEST PRICING ON SMARTPHONES AT AMAZON! REAL TALK ON QUALITY - IS HEAVY BETTER? There's no super technological insight on this post. This is just a rant based on a question that I'd like to put out there to the smartphone world. Why does "heavy" mean better quality? Day after day, I read reviews on Samsung smartphone products from all the gadget pundits. 9.9 times out of 10, writers claim that Samsung devices feel "cheap", because they don't have the heavy build of HTC, Apple, and other brand products. This does not make sense to me. But time after time, the "experts" claim that heavy is better, and a bulky solid build means "quality". While the tech world pushes to make devices thinner and lighter, the complaints seem to go on and on despite the obvious advantage. Have you ever dropped an iPhone or an HTC smartphone? Unless you like spending your hard earned money on expensive fragile smartphones, I can't for the life of me figure out why so many people complain that lighter weight devices feel "cheap". The Samsung Galaxy S IV is about to be released this month. For the third time (since the release of the Galaxy S II), the complaints about the apparent cheap build are rolling in strong. They say that the Galaxy smartphones are too plastic-like. Forget the fact that they are made out of durable polycarbonate material. They are just cheap... or so they say. I drop my phone on a regular basis. It happens daily. I owned an Apple iPhone 3GS, and an iPhone 4. Both were dropped from a height of 2 feet or less, and both were destroyed in one drop. But I have drop-kicked my Galaxy S II trying to catch it with my foot, and I have yet to break it. To me, a lighter weight smartphone with a stronger material is common sense design. The heavier the phone, the harder the impact it brings when it says "hello" to the concrete. That is why I have had so much better luck with my Galaxy S II. But just as with comparisons to Apple products, writers claim that the HTC devices have more of a solid "quality feel" too. I don't get it. While the HTC devices can handle impact a little better than iPhones, they still can't survive a drop like a Samsung smartphone. I don't know how you iPhone and HTC owners feel about this, but I don't want a smartphone that feels like a pack of lead sinkers in my pocket. I don't want to know it's there when it is snugly packed away in my front pocket. But the madness continues with writers claiming that "heavy" equals quality. When I tested the Samsung Galaxy S III from AT&T, I thought the look and feel was fantastic. Never once did I feel that the S III was "cheap" because of the material used. And the Galaxy S IV will follow with an equally light design, but thinner. I love the gigantic 5" screen size on the new Galaxy S IV. Bigger is better in my book. And I think it awesome that the S IV will be thinner, built with polycarbonate material, and maintaining it's feather-light weight while increasing the size. So many people were expecting Samsung to "improve" the quality of the build by creating a heavy, more dense device with a new material. I imagine they wanted to see a composite build similar to the HTC One X or the Nokia Lumia 920. Both of those handsets, in my opinion, are just too heavy. I'll be the first writer to say that I am happy that Samsung has decided to continue manufacturing lighter, thinner smartphones with the new form factor of the Galaxy S IV. I can't wait to get my hands on my own Galaxy S IV the minute my upgrade is available in May. 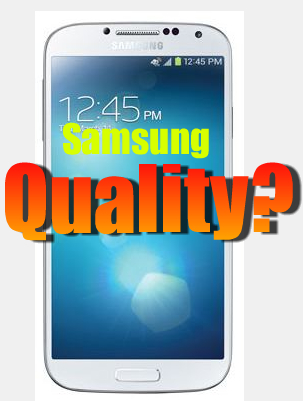 Maybe the rest of the mindless writers can go shopping for Galaxy S IV cases made from a lead alloy so they can get that "quality feeling" that they are looking for. Meanwhile, I'll take it like it is. And I will not be putting a case around my S IV... because it doesn't need one.